Writing the biography of one of the music industry's legendary performers is a daunting task. 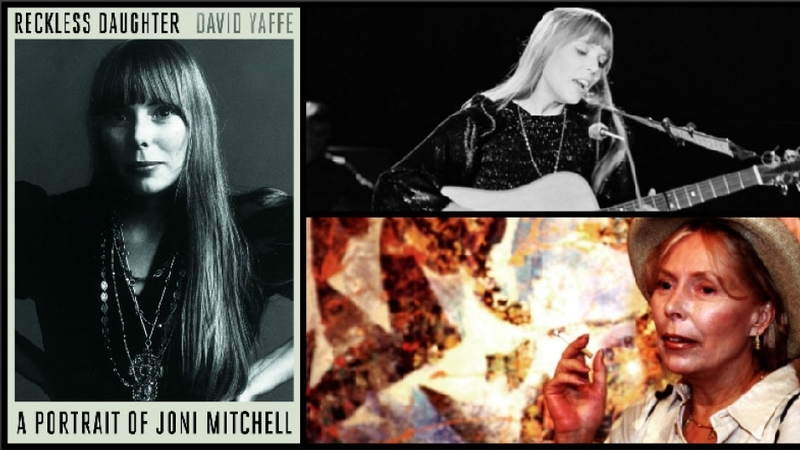 When David Yaffe's book, Reckless Daughter: A Portrait of Joni MItchell, was published earlier this month, he wrote a personal letter to Mitchell. "She would reveal things to me and then regret it, and then do it again and regret it,"
"I never thought that you would read this book," Yaffe writes in the letter, "or that it would be possible to fully live up to your greatness, but I gave it my all anyway." As Yaffe tells Day 6 host Brent Bambury, Mitchell is very protective of her personal story. "There was something about her that wanted to reveal things. And she's a born storyteller. She loves to tell stories," explains Yaffe. "But then she later regrets it, because then she feels she gave too much away." Like you do for your silent mystery." Despite her success, Mitchell is vulnerable. And suspicious. That is, in part, why writing her biography was so daunting for Yaffe. "She would reveal things to me and then regret it, and then do it again and regret it," says Yaffe. Yaffe crafted Mitchell's biography over a 10-year period, during which he spent hours interviewing Mitchell. He also spoke with more than 60 of the people closest to her. Throughout the span of her 50-year career, Mitchell has collaborated with other big names in music, including Joan Baez, Herbie Hancock, Judy Collins and Leonard Cohen, all of whom spoke with Yaffe. "He recognized her greatness but she was also a beautiful woman that he wanted to get close to." That was how Yaffe learned that Cohen not only influenced one of Mitchell's biggest hits, "A Case of You," from the album Blue, but that Mitchell also influenced Cohen, including for his songs "Bird on a Wire" and "Joan of Arc." Cohen and Mitchell had a short-lived romance in the 1960s, and much to his surprise, Yaffe found Cohen quite willing to talk with him for the Mitchell biography. "It just happened, that he decided he wanted to meet with me. It was very spontaneous," says Yaffe. "We went to this pizza place and he kept on saying: 'Isn't this place great? Isn't this place great?' And he called the waitress 'darlin'." Cohen spoke very openly about Mitchell. He was drawn to her because she was "a great artist, and a great singer, and a great writer and guitar player." "To him, these were discreet things," says Yaffe. "He recognized her greatness but she was also a beautiful woman that he wanted to get close to." Bambury notes that while Mitchell can get close to people, she's also known for pushing people away. "That need for independence is connected to that creative thirst," says Yaffe. "She had to be independent. She couldn't make those albums being Mrs. Anybody." "She had to fend off Graham Nash's marriage proposal," explains Yaffe. "If she hadn't done that she wouldn't have made those great albums that followed, starting with Blue." Blue, which was released in 1971, was ranked number 30 on Rolling Stone's "500 Greatest Albums of All Time." "She wouldn't have made those albums as Mrs. Graham Nash. No way," says Yaffe. "She had to be independent. She couldn't make those albums being Mrs. Anybody." Yaffe is quick to note that Mitchell still loved Nash, despite not wanting to marry him. "She loved other people after him. She loved James Taylor. She tried to love Jackson Browne," says Yaffe. "And then she loved Larry Klein very, very much and married him." Klein established himself as a music producer during his marriage to Mitchell, which lasted from 1982 until 1994. Mitchell is still recovering from a stroke and brain aneurysm that she suffered in 2015. Earlier this year she made a rare public appearance, attending Elton John's 70th birthday party in Los Angeles. But Yaffe says Mitchell has made many attempts over the years to step away from the limelight. "She hated the music business so much, but she felt that she had such a responsibility to her gift - what I would call her genius." I could skate away on." "But then she kept on going back in," says Yaffe. "It was cyclical that she would try to get out of it and think, 'oh, I'm just going to paint'. But then more songs would come." When asked if Yaffe thinks she'll make another album, he says "that's highly unlikely." Both because of her health and her lack of interest in recording more music. "It think that's it, probably." Yaffe is a huge fan of Mitchell's. He says writing this book changed him. In his letter to Mitchell he thanks her for her music, her words and her influence. "I was so fortunate that I had the opportunity to listen to you, to learn from you" he writes. "And to spread the word about this magnificent, defiant and totally original woman to whom I dedicated years of my life ... You were worth it all." This article has been viewed 1,540 times since being added on October 28, 2017.